A heart attack occurs when blood flow to the heart is interrupted. The decreased blood flow leads to damage or death of the affected heart muscle. Other names for heart attack include coronary attack, myocardial infarction, coronary thrombosis, and coronary occlusion. A severe heart attack can lead to major disabilities or death. Those with less severe heart attacks may have a long recovery and return to normal life. Oxygen is necessary for all cells in the body to survive, and working muscles like the heart have some of the highest demand for oxygen. Oxygen-rich blood is delivered to the heart muscle through a series of blood vessels called the coronary arteries. Damage or blockage to these arteries can slow or stop blood flow to the heart muscle. Cells in the heart start to die if they are without oxygen-rich blood for more than a few minutes. Heart cell death results in permanent heart muscle damage. The amount and severity of damage to the heart muscle will depend on how much blood flow was interrupted and how much of the heart was supplied by the blocked blood vessel. A smaller artery may only supply a very small area of the heart. Damage to this small of an area may not greatly impact the heart; however, a blockage in a larger artery may damage a larger section of the heart that can greatly impact the function of the heart. Atherosclerosis is the buildup of plaque in the arteries that occurs over time. Items in your blood, such as fat and cholesterol, can stick to the walls of your blood vessels and gradually develop a hardened plaque on the artery walls. The plaque growth narrows the arteries, which can slow and eventually stop the flow of blood through the artery. 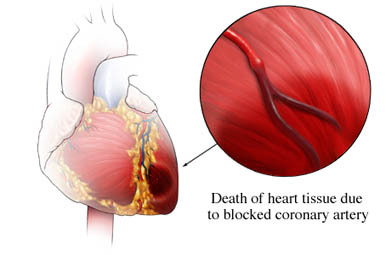 Coronary artery disease (CAD) is when this process occurs in the arteries of the heart. CAD is the leading killer of men and women in the United States. A heart attack is often the first sign of CAD. Blood vessels have muscular walls that can tighten or loosen to help blood flow. Problems with nerves, blood vessel structure, injuries, or stimulants can cause these muscles to spasm and tighten, making it difficult for blood to flow through the blood vessel. Although spasms can cause problems on their own, they may be more likely to cause blockages in blood vessels with current atherosclerosis. A thromboembolus is more commonly known as a blood clot that can travel through the body until it becomes trapped in smaller blood vessels. Blood clots can develop for a variety of reasons including injuries, blood clotting disorders, or pieces of plaque breaking off and floating in the blood. 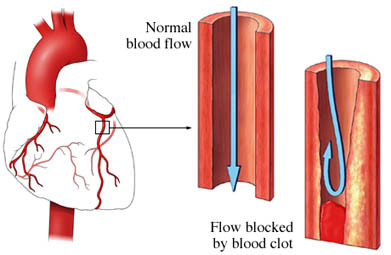 A heart attack occurs when the clot blocks the flow of blood in one of the coronary arteries. What are the risk factors for heart attack?What are the symptoms of heart attack?How is heart attack diagnosed?What are the treatments for heart attack?Are there screening tests for heart attack?How can I reduce my risk of heart attack?What questions should I ask my doctor?What is it like to live with heart attack?Where can I get more information about heart attack? About heart attacks. American Heart Association website. Available at: http://www.heart.org/HEARTORG/Conditions/HeartAttack/AboutHeartAttacks/About-Heart-Attacks%5FUCM%5F002038%5FArticle.jsp#.VxEYhk2FMdU. Updated January 27, 2017. Accessed March 2, 2017. Stern S, Bayes de Luna A. Coronary artery spasm: A 2009 update. Circulation. 2009;119(18):2351-2534. What causes a heart attack? National Heart, Lung, and Blood Institute website. Available at: http://www.nhlbi.nih.gov/health/health-topics/topics/heartattack/causes. Updated January 27, 2015. Accessed March 2, 2017. What is a heart attack? National Heart, Lung, and Blood Institute website. Available at: http://www.nhlbi.nih.gov/health/health-topics/topics/heartattack. Updated January 27, 2015. Accessed March 2, 2017.